Perfect for entertaining over this Christmas period. Serve with pita chips, tortilla chips, or cut up vegetables. 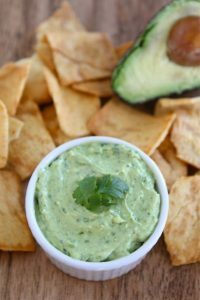 Place the yogurt, avocados, garlic, cilantro, jalapeño, lime juice, and cumin in a blender or food processor. Mix until smooth. Season with salt and pepper, to taste.